Ever wondered why it can be hard to get started on those weekend tasks like mowing the lawn and cleaning up the garden? It probably has something to do with having to get all of the tools ready (ie find them all), finding the energy to do the work, cleaning up afterwards and then putting all of the tools back again. Storewall’s Lawn Care Kit can help with most of these challenges and we are happy to throw in an energy bar to give you a boost of energy. If you have every watched a technician or handyman at work, one thing you will notice is how well they look after their tools. They will carry a tool bag and each key tool will be in there, placed in the exact spot they need them in. Furthermore, once the job is done, each tool is cleaned (or dusted) and placed back in the spot it came from. Ever wondered why they are so meticulous about their tools? Firstly A grade tools are a big investment. Secondly if they lose their tools or just throw them all in the bag in whatever order, getting them out can sometimes be harder than completing the actual task at hand. I hate mowing the lawn (especially in summer time) but I like the look of my home when its done. I also like the smell of freshly cut grass. By keeping all of my key gardening tools in one place it has made it a whole lot easier. The mower is near the gerry can of petrol. It’s also next to the wipper snipper and the plastic cord used to refill it. My gardening gloves are close by as are my range of gardening scissors. It’s all in one place, easy to grab and go. Easy to get started! 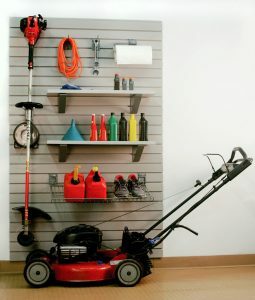 Storewall is all about organising your garage and tool shed or workshop. 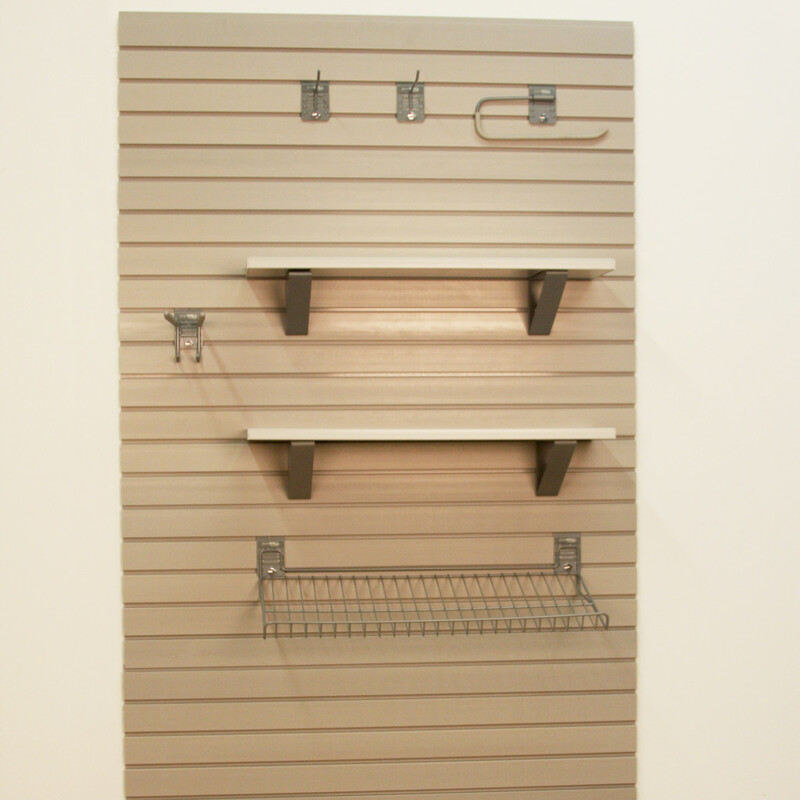 Whether its wall panels you are after or hooks, we have them all. When it comes to gardening, we have made it easy to get started by creating our first Storewall bundle the Lawn Care Kit. The combined slatwall panels will cover a total space of 2.16m squared. If you don’t have the height, you can remove one of the slatwall panels to make them five. Each slatwall panel is 1.2m in width (left to right) and 300mm in height (top to bottom). The Lawn Care Kit bundles includes a carton of 1.2m panels which holds 6 slatwall panels. Unfortunately we can’t break the 6 panel carton for you. Please also note that the image on this page has 2 flat shelves and 1 wired angle shelf. We have replaced the 2 flat shelves with two flat wire shelves.